Hello! 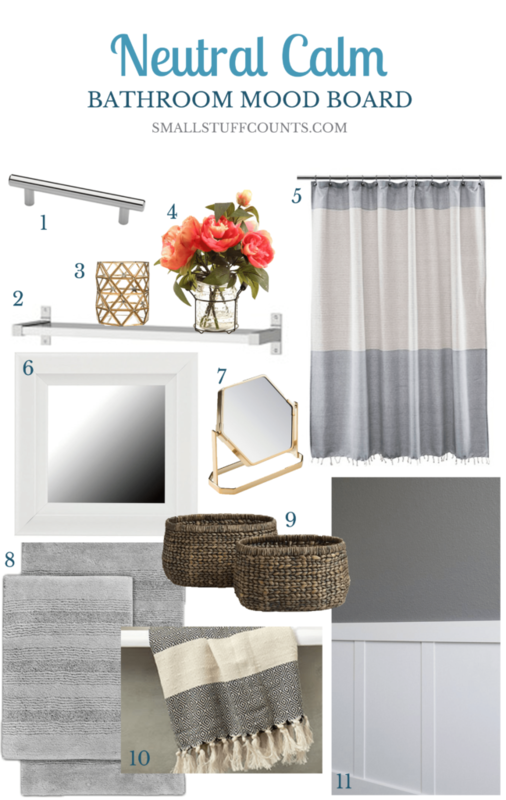 I’m back today with an update on my One Room Challenge project – our small-but-mighty bathroom. Week one has been filled with painting, and I have once again been reminded at the impact a gallon of paint can make on a room! 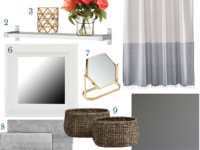 As a refresher, I started the One Room Challenge alongside a few hundred other bloggers last week, and I’ve set out to make over our bathroom in five short weeks. 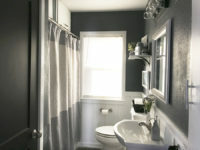 As I mentioned last week, I have little time to work on this room each week, which is why I chose a small bathroom for this round of the One Room Challenge. So I’m afraid I don’t have any drastic transformations to show you today. 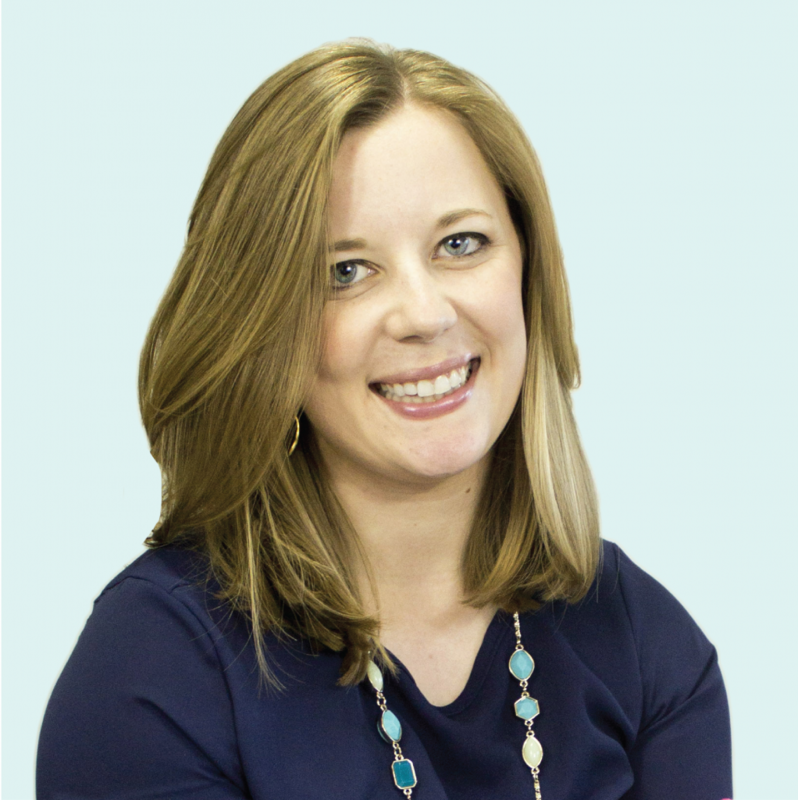 But I do hope that following my room makeover over the next few weeks will demonstrate how much you can do to improve your home even if you only have a few hours to spare each week. I spent about four hours working in the bathroom last Sunday. 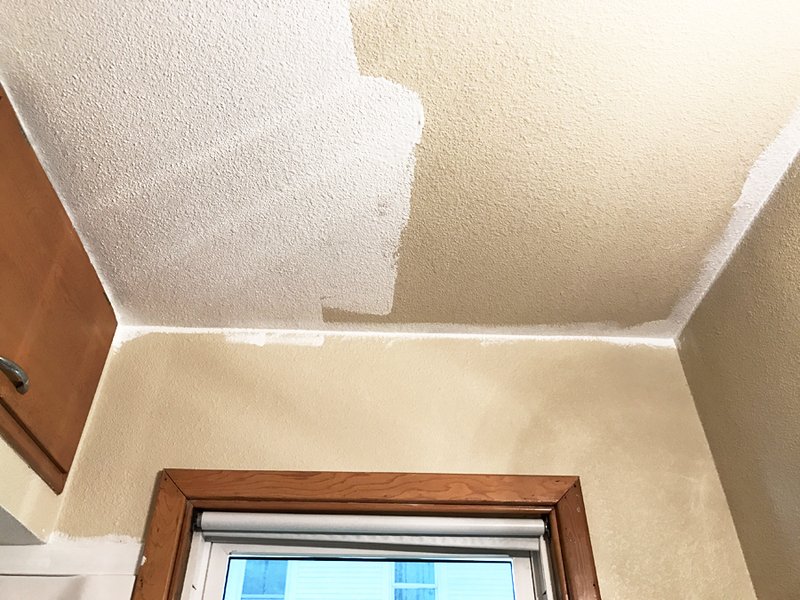 I painted over the beige ceiling with a fresh coat of white paint, and it is amazing what a difference that one simple task did for this room! 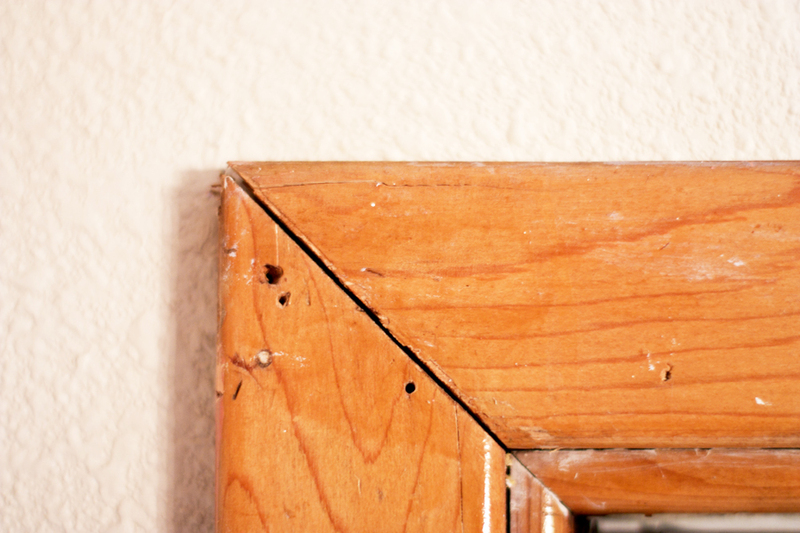 The trim in this bathroom was in pretty rough shape with a lot of old nail holes to patch, and some larger cracks to caulk. This part of so tedious, but really does make a big difference in the end! Here’s a close-up of the corner of the window. See how much patching it needed? 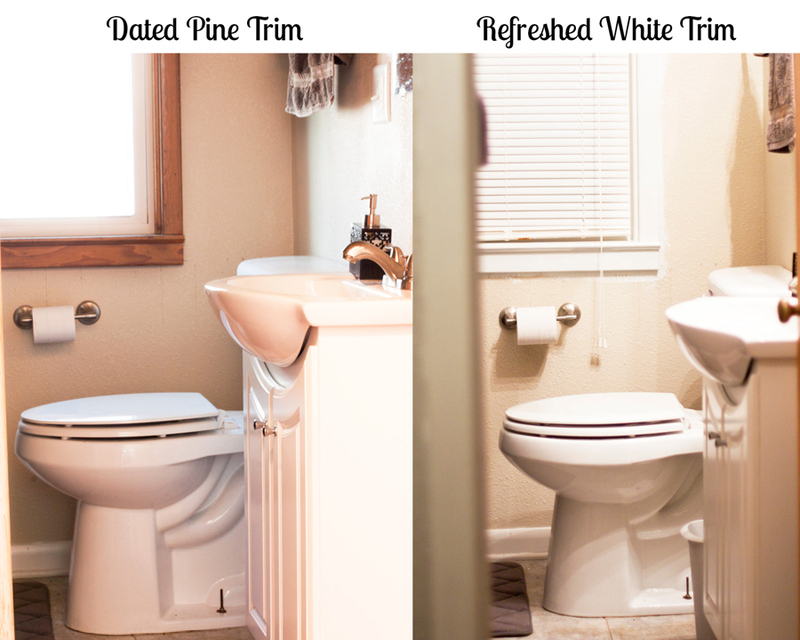 And below is a side-by-side look at the difference updated trim can make. The bathroom had a pretty crappy roller shade over the window when we moved in, and it was doing the job fine so I was planning to recover it with fabric. But after I took it down to paint the trim, I realized how rundown the roller shade was. So I scrapped it and hung new blinds. They’re cheap blinds, but that’s okay because I will likely convert them into a roman shade of sorts before this makeover is complete. But for now, the new window treatment combined with crisp white trim makes me smile. Although this bathroom is small, there is a lot of trim to paint! I painted the window frame, the closet door frame, the main door frame and the trim along the top of the shower. Plus I painted the baseboards and ceiling. I think I still have a bit of white paint hiding in my hair somewhere! I should also note that this room makeover is challenging my mediocre photography skills! David found me standing in the bathtub with my camera on a tripod the other day, which made for some good laughs. The lighting is testing my photography know-how and my only camera lens in working order is really not the best for this. But hopefully my photos will improve as the makeover progresses! 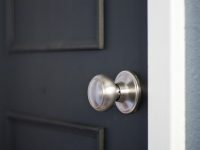 My next tasks are to paint the walls, add some trim to the lower portion of the walls and paint the cabinets and doors. We’ll see how much I can get done this week! Wish me luck! I’ll be back with another progress report next Thursday. Until then, go check out the progress all of the other bloggers are making on their rooms. 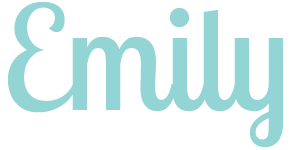 There are sooo many inspiring projects in the works! I love seeing real-time progress updates from all of the bloggers during the One Room Challenge. They’re the perfect podcasts to listen to while working on projects! If only they’d release one a day so we wouldn’t run out, right? Any other good podcasts you’d recommend?